Ramiro Gomez was born to immigrant parents in the Inland Empire region of Southern California, east of Los Angeles. After leaving the California Institute of the Arts, Gomez worked as a live-in nanny with a Beverly Hills family, where he keenly observed the relationships between heads of households and their staff. Gomez found the dynamic between family and staff to be paradoxical – at once intimate, trusting and close, but also prone to abrupt dissolution for various reasons. 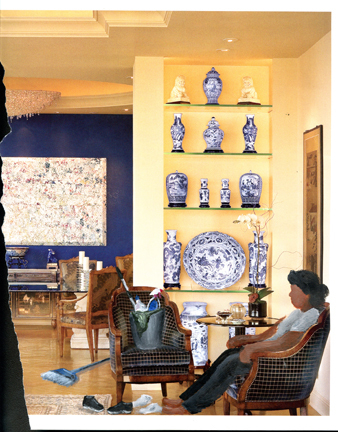 His experiences there were the impetus for the work in Domestic Scenes. 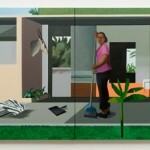 Gomez’s acrylic on canvas paintings use David Hockney’s iconic 60s Southern California scenes as a jumping off point, interrupting the original compositions with the introduction of Latino domestic workers into the works. Ramiro Gomez was born in 1986 in San Bernardino, CA. In 2013 Gomez had a solo exhibition @ the UCLA Chicano Studies Research Center, and was an artist-in-residence at the CSUF Grand Central Art Center in Santa Ana, CA. Also in 2013, Gomez exhibited at the AFL-CIO National Convention, where he was also a Guest Lecturer. He also gave lectures at Stanford University, UCLA and UC Santa Barbara from 2012-13. 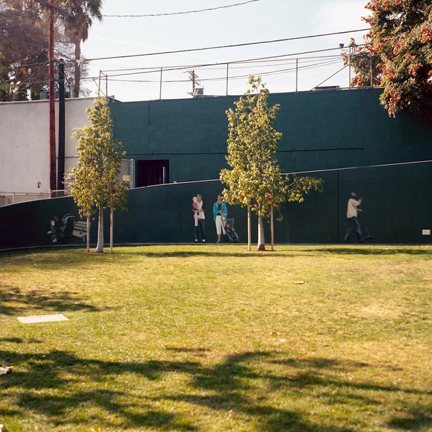 The City of West Hollywood, CA awarded Gomez with a residency in 2013, where he installed a mural in West Hollywood Park – a project titled The Caretakers, which remains on view. His work has been covered in the Washington Post, NPR, the Los Angeles Times, Hyperallergic, Huffington Post, and CNN. Gomez lives and works in West Hollywood, CA. To learn more aboutRamiro and how we connected with him and his artwork, check out our blog. 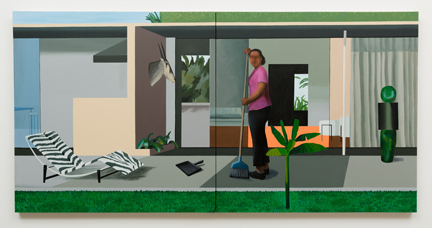 Ramiro Gomez, Beverly Hills Housekeeper, Acrylic on canvas, 72 x 144 inches, 2014. 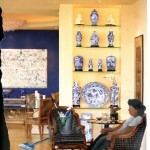 Courtesy of the artist and Charlie James Gallery, Los Angeles. 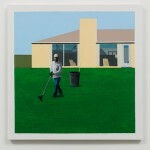 Ramiro Gomez, The Lawn Maintenance (after David Hockney’s A Lawn Sprinkler, 1967). Acrylic on canvas. 48 x 48 inches. 2014. Courtesy of the artist and Charlie James Gallery, Los Angeles. Ramiro Gomez, Las Meninas, Beverly Hills, 2013. Courtesy of the artist and Charlie James Gallery, Los Angeles. Ramiro Gomez, Grizelda Takes A Break, Acrylic on magazine, 11 x 8.5 inches, 2013. Courtesy of the artist and Charlie James Gallery, Los Angeles. 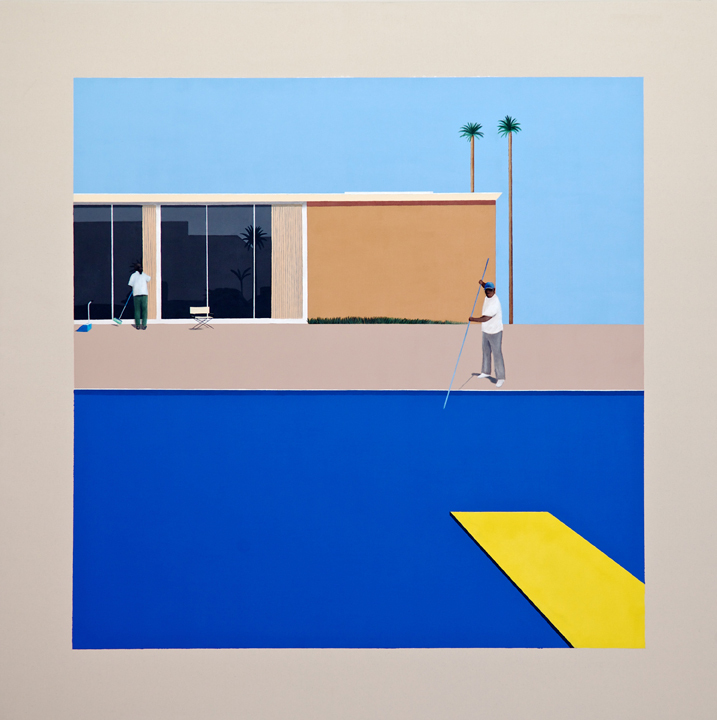 Ramiro Gomez, No Splash (after David Hockney’s A Bigger Splash, 1967), Acrylic on canvas, 96 x 96 inches, 2013.Courtesy of the artist and Charlie James Gallery, Los Angeles. Ramiro Gomez, The Caretakers, West Hollywood Mural, 2013. Courtesy of the artist and Charlie James Gallery, Los Angeles. 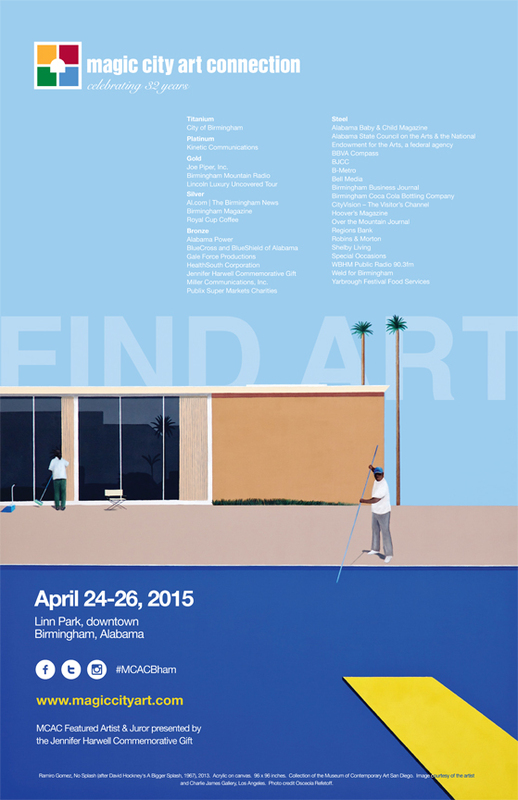 2015 Magic City Art Connection Poster Design featuring Ramiro Gomez’ “No Splash (after David Hockney’s A Bigger Splash, 1967)”. 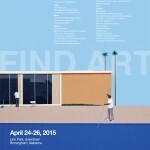 Poster Design byScott Miller of Miller Communications, Inc.